It’s been over seven months since social media giant Facebook first introduced Graph Search, you may be wondering what it’s good for. Well the short answer: A lot! We’ve been busy using Graph Search at Marwick Marketing for a few months on the beta version and we’ve found some clever ways to make use of Graph Search. Facebook Graph Search has been slowly rolling out to the users that signed up for it way back in January, when it was initially unveiled. Some of us at our online marketing company in Vancouver have had it for a while, while some of us have only recently gotten our mitts on it. So we started talking about some ways you could make the most of it if it’s your turn to try it out. If you don’t have it already, you can read more about it and sign up here. If you’re planning a lunch out in Vancouver and need some suggestions on places to visit or restaurants to try, usually your friends who live in a given city are great people to ask for advice. 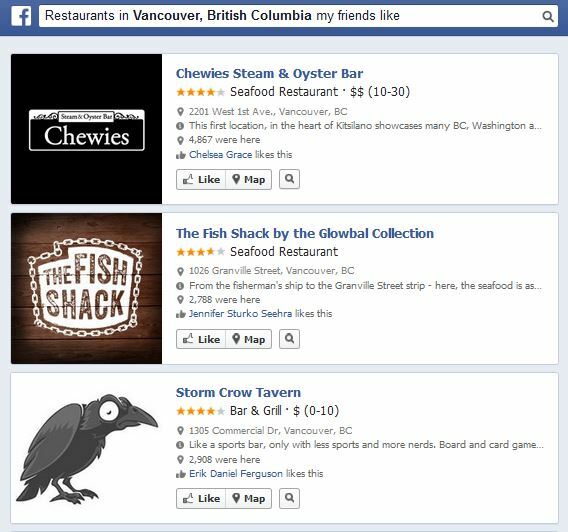 With Graph Search you can provide a long-tail keyword like “restaurants in Vancouver my friends like” This one will show you all of the restaurants (and their Facebook pages) that your friends—whether they live in the town or not—have liked. Perfect for dining out like the locals! Looking for a museum to visit, an art gallery, or a cool local business? 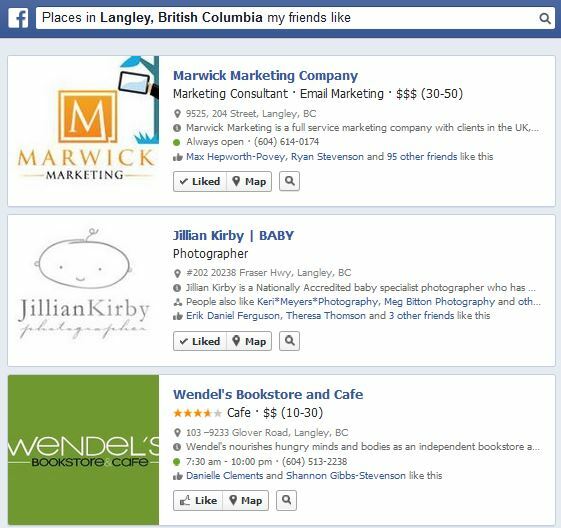 If you search “places in (town) that my friends like” it shows you all the local businesses and pages in that city or town that your friends like. And what if you’re doing a whistle stop tour of a new city and want to see who lives there? Easy search “my friends who live in (City)” and give them a nudge for a cold beer or a sofa to crash on! My friends who like [Band/Artist Name]. You’ll never go to a concert alone again. My friends who like [Object (Beer, Barbecue, Disc Golf etc)]. If you’d really like to try a nearby restaurant, but it’s one of those places better enjoyed with friends, this search will help you find some people to get together with and go. Similarly, if there’s a local wine festival, beer festival, chili cook-off, or BBQ battle, a little creative searching will help you find a posse to take with you so you all have a good time. Friends of my friends who like . Looking for new friends, or perhaps a potential date? This search will help you find people with whom you have a common friend and a common interest. That way even if none of your friends are into video games, or none of your friends particularly want to go see Man of Steel with you, you can find someone else who will—or at least someone else you have a lot in common with but wouldn’t have known if you hadn’t gone looking. 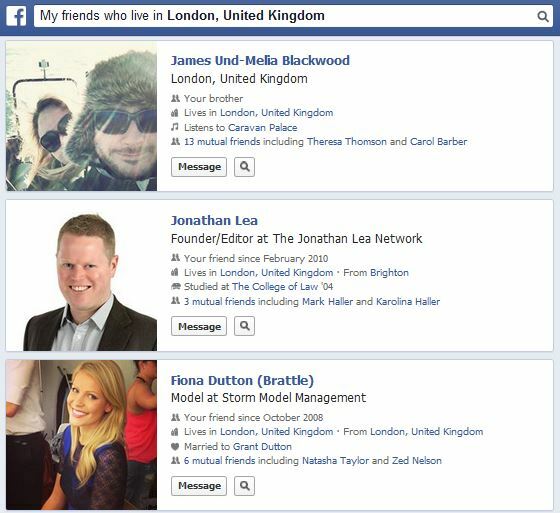 Of course, you may want your mutual friend to make the introductions before you just reach out on Facebook. Once you’ve figured out how powerful Facebook’s online Graph Search can be you may find yourself searching some classics…let’s just leave it at that (or check this blog).